Looking to give a healthy gift with a lasting impact? 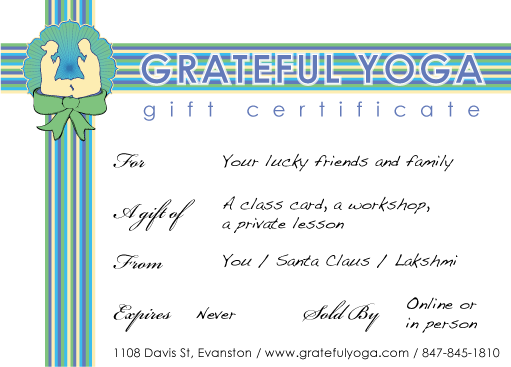 A gift certificate from Grateful Yoga could be a way to support your loved ones in their movement towards health and happiness. 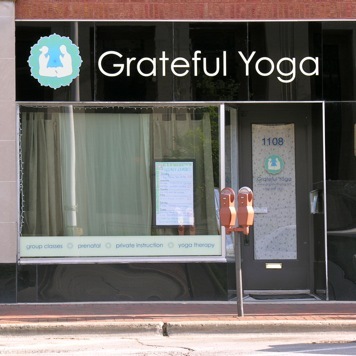 Introductory 5-class package for $80: Good for any drop-in yoga class. Never expires. Any amount: Can be applied to a client's account. 12 class card for $185: Can be used at any of our weekly yoga classes. Never expires. Recommended for people who have already taken our classes and who can definitely come more than once a week. Single class for $18: Give a simple, one-time gift that allows your friend or loved one to try out a yoga class with us. No expiration, use at your convenience. Private Yoga session for $105: Treat your loved one to a one-on-one session with a Grateful Yoga teacher in their home or in our studio. Learn more about private instruction here. No expiration. Group private/couple's yoga: Treat a group of friends or a couple to an in-home or in-studio private session. Contact us for rates. Yoga Combo Packs: Contact us to design a yoga "combo pack" to fit your budget and the giftee's needs. For example, you could combine a private lesson, workshop, and a 6 class card. We are happy to offer a 5% discount for combination purchases. We will email you the gift certificate as a PDF that you can print for the lucky recipient. Alternatively, we can mail you a paper certificate - please let us know if you prefer this option. We take all major credit cards. Call us at 847-849-1810 if you need gift suggestions or purchasing assistance.